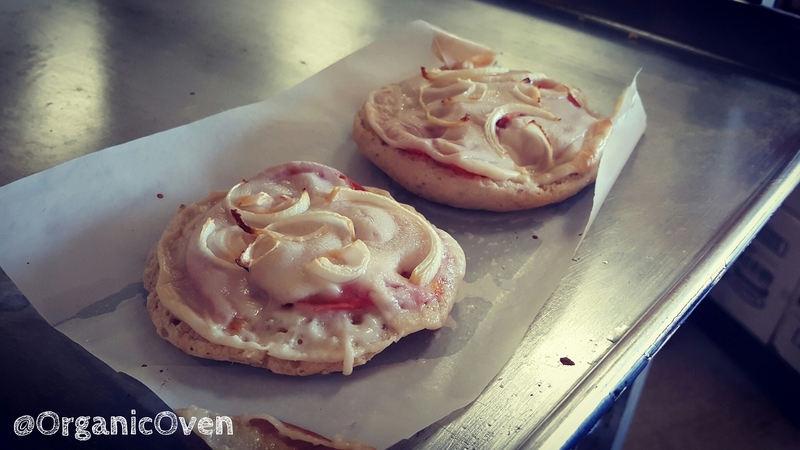 Back when I had a cafe in uptown Toronto, one of the most popular quick meals we sold was the gluten-free pizza bagel. We just took one of our popular gluten-free bagels, cut it in half, slapped on some chopped vegetables, topped it with slices of organic cheese, popped them into a toaster oven and in less than 10 minutes, you had a healthy lunch in your hands. I LOVED MY TOASTER OVEN. I also had one at home, despite having both a regular oven and a toaster. Sadly, it’s given up on me and I’m in the market for a new one. But when I had it, it prompted me to create quick little meals that just seem so much more complicated if it involved a conventional oven. Now, you don’t necessarily need to run out and get a toaster oven for this one. A regular oven will do. By the way, this yummy meal is kid-approved (I have three picky kids) and it is completely lunchable. Did I mention that it’s also vegan? Start by cutting the bagel in half and laying it flat on a cookie sheet. Spread the ketchup or pizza sauce on top of each half. Top with your favourite toppings. Sometimes I put large slices of veggies. Sometimes I chop them into little pieces bruschetta-style. Do what makes you happy! I also like to sprinkle some freshly-ground black pepper on mine. Some of our customers liked dried red pepper flakes. Put it in a pre-heated toaster oven at 350 degrees Farenheit. My eldest daughter is just like her daddy. Those two hate tomato sauce and basil. An alternative that we offered at the cafe was to drizzle each bagel half with extra virgin olive oil and thin slices of fresh organic tomatoes. The juices and flavours from the tomatoes provides a natural sauce as it cooks, and it ensures that the final product isn’t too dry. Believe it or not, you can make a bunch of these in advance and then freeze them. I have to warn you, though. Daiya cheeses have gotten extra melty over the years (WHICH I LOVE). So, here are some tips and tricks to help keep the cheese on your pizza and not on your containers. First cool the pizzas to room temperature and lay them flat, side-by-side on a cookie sheet. Place the cookie sheet in the freezer for about an hour (or until the cheese is noticeably harder). Stack them on top of each other, using pieces of parchment to separate them. Store in a container or large Ziplock bag. Sometimes, I just wrap each one individually in cling wrap and then stack them inside a bag. You can thaw one overnight in the fridge or throw it straight into a lunch bag. I usually re-heat my daughter’s pizzas in the morning if I have time, and then I throw it into a heat-safe container. If a classroom or lunchroom has a microwave then I just throw it in my daughter’s lunch bag frozen and she can heat it up at school. This entry was posted in #ICanHaveThat, Blog. Bookmark the permalink.